J.M. 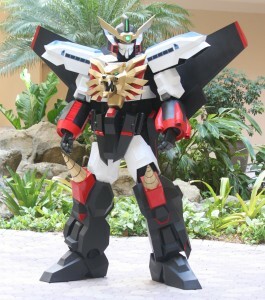 Field Marketing’s Fulfillment Team Lead, Ben Albert, won Best of Show at the Florida Anime Experience costume competition for his giant robot costume “GaoGaiGar”. The Florida Anime Experience, founded in 2011 to showcase anime, manga, and other aspects of Japanese pop culture, takes place at the International Palms in Orlando every year and features a costume contest, vendors, Artist Alley, panels, workshops, cosplay, and a Japanese video game room. Other categories in the costume contest included Best Action, Best Comedy/Parody, and Best Drama/Romance. By winning Best of Show, Albert and his costume will be heading to the Anime Expo taking place July 4-7, 2013 at the Los Angeles Convention Center. It is the largest anime, manga and Japanese culture convention in North America and is also the second longest running anime convention. Albert’s costume was inspired by GaoGaiGar from the 1997 show The King of Braves GaoGaiGar. The King of Braves GaoGaiGar is about the Gutsy Geoid Guard, a secret organization created by the Japanese government to battle impending alien threats. Albert’s elaborate costume took about 9 months to construct and is made from materials including EVA foam, Sintra and Foamcore board. Dual speakers in the chest allowed Albert to play sound clips and effects from the show. There was also lighting in the lion’s eyes, the crest in the head and the G-Stone on the forehead. Talk about special effects! All of us at J.M. Field Marketing would like to wish Albert the best of luck at the upcoming Anime Expo.